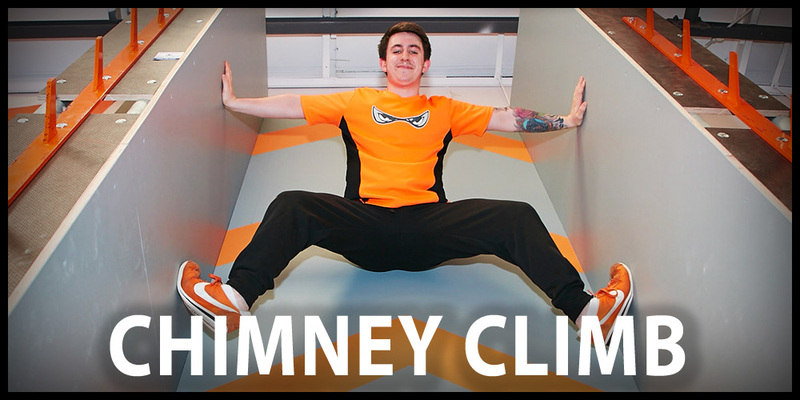 NOT UNLIKE THE SPIDERWALL – WEDGE YOURSELF BETWEEN THE PARALLEL WALLS OF THE CHIMNEY AND EDGE YOUR WAY TO THE TOP… YOU’LL NEED A HEAD FOR HEIGHTS AND YOU MIGHT WANT TO THINK ABOUT HOW YOU’LL GET DOWN BEFORE YOU START! Climbers probably think that this obstacle is a breeze – but then climbers have great confidence in their ability to wedge themselves between solid surfaces and the agility and strength require to move to the next point on their route. Not a climber? Here’s your chance! Check out the training tips below then book a ninja training session to perfect your quintuple steps technique – or if you think you can conquer the whole course book yourself a time trial and show us what you can do, against the clock! Think about your descent - before you start!